Knee pain that occurs suddenly from a direct impact, twisting or collision is known as acute knee pain. Chronic knee pain occurs gradually over time, often through overuse. The athlete often trains through the pain as an inconvenience or niggle. However, if left, these niggles get progressively worse and become chronic knee injuries, which are often very difficult to treat. When to see a doctor about my knee pain? Sudden onset knee injuries involve injury to various structures of the knee, including ligaments, tendons, cartilage, and even bone. They are caused by collisions, or twisting the joint. Symptoms include sudden acute knee pain, rapid swelling, heat in the join, and bruising. Diagnosing an acute knee injury can often be difficult because the knee is so painful and swollen. When the swelling goes down various assessment and diagnostic tests can be done. Read more on Acute knee injuries & knee joint pain. The most common cause of gradual onset pain on the outside of the knee is Iliotibial band friction syndrome. The athlete will complain of pain over a bony area on the outside of the knee, which comes on at a certain point in a run. The pain goes away after a period of rest, only to return again once training resumes. Another cause of outside knee pain is an injury to the lateral cartilage meniscus which can degenerate over time, or from an acute knee joint injury. View all causes of Lateral knee pain. Gradual onset pain on the inside of the knee is less common than sudden onset injuries causing inner knee pain. One major cause, particularly in older athletes, is osteoarthritis, which is wear and tear or degeneration of the joint, especially the thin cartilage protecting the ends of the bones. Symptoms may develop gradually over a period of months or years and include a deep aching pain in the knee with joint stiffness, particularly in the mornings or after a period of inactivity. Other causes include synovial plica irritation, pes anserine bursitis and medial ligament sprain which is usually an acute injury but can develop through repetitive strain such as kicking a ball with the inside of the foot. View all causes of inside knee pain. Chronic pain at the back of the knee, which develops gradually is likely to be from an overuse injury to one or more tendons, which join muscles to bone. 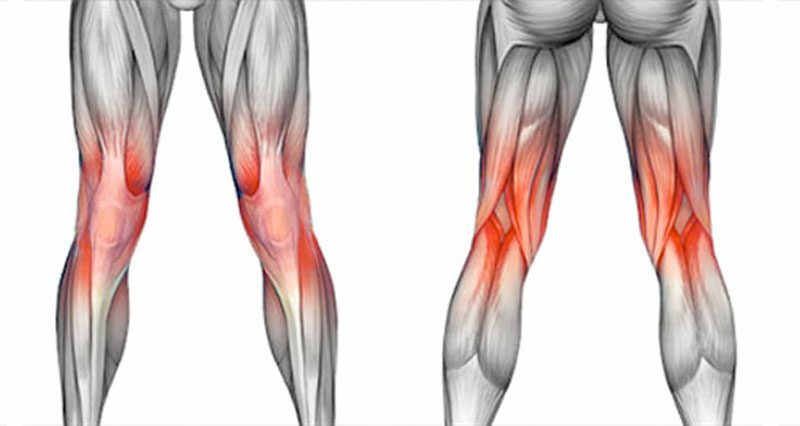 One of the more common causes is Biceps femoris tendonitis, which is inflammation of the tendon of one of the powerful hamstring muscles. Gastrocnemius tendon inflammation occurs at the point where the large calf muscle originates at the back of the knee. Symptoms include pain and stiffness, especially first thing in the morning. A large swelling at the back of the knee could be Baker’s cyst. View all causes of pain at the back of the knee. The two most common causes of pain at the front of the knee are patellofemoral pain and patella tendonitis (Jumper’s knee). The patellofemoral joint is the point where the kneecap touches the femur or thigh bone. It is common for the patella to rub on the bone underneath, causing friction, swelling around the patella, and pain. Jumper’s knee is inflammation (or more likely degeneration) of the patella tendon, which joins the kneecap to the tibia (shin bone). Pain is felt at a specific point at the bottom of the patella. Osgood Schlatter’s disease commonly affects young children between the ages of 8 and 13 years old and results in pain at the tibial tuberosity or bony bit below the knee at the top of the tibia. View all causes of anterior knee pain. All acute and chronic knee injuries should be treated using the P.R.I.C.E. principle (protection, rest, ice, compression & elevation). This should be applied at home for at least the first 2 – 3 days. Prevention- Protect the knee injury from further damage. Stop training or playing immediately and apply cold therapy and a compression wrap. Where applicable, use knee support or brace. Rest – Refrain from exercise and try to reduce the demands of your daily activity to encourage recovery. It not only refers to the prolonged period of time that the athlete will be out of action but also to the immediate period after the injury. An athlete must know when to stop training and allow the injured area to heal otherwise repetitive minor injuries can often result in a more severe injury that keeps the athlete out for much longer. Ice – The topical application of ice or cold therapy to the area of the knee injury/swelling can assist in reducing the symptoms of pain and inflammation. Compression – The use of compression support or compression bandages to the knee can help reduce swelling. Elevation – Keeping the knee elevated above heart level whenever possible to help reduce swelling due to the effects of gravity. 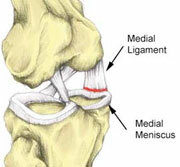 The majority of knee injuries, especially the minor ones can be treated at home. However, if you have any of the following symptoms including severe pain, severe swelling, a pop or crack, locking and altered sensation you should seek further medical assistance. Altered sensation in the foot such as a feeling of “pins and needles” (paresthesia) or a “loss of feeling” (anaesthesia) in the lower leg. Further medical assistance can be sought through either your local doctor or a private clinician such as a physiotherapist, sports therapist, osteopath, or chiropractor. In the first instance, if you have followed the P.R.I.C.E principles (see above) and are still unable to walk after 72 hours or still have severe pain that is not subsiding after the first 72 hours you should visit your local A&E department for further assessment. Also, if your knee gives way whilst walking, feels loose (“unstable”) or locks (unable to move the knee due to pain) then you should consult your doctor or visit A&E. Secondly, if you have applied the P.R.I.C.E principles and still have weakness or knee pain that lasts a long time (more than 2 weeks), or have ongoing discomfort in your knee, you are highly recommended to seek advice from a specialist expert- such as a physiotherapist, sports therapist, osteopath, or chiropractor who can provide you with advice and an appropriate and effective recovery and rehabilitation program.